There are days when I like my job, but many when I just want to sit in a cubicle and deal with people over the age of 17. Being a teacher is really hard and can take a lot out of a person, but there are times when I realize why I got into this profession. These days are like fuel: they keep me going when I feel like turning the other direction. 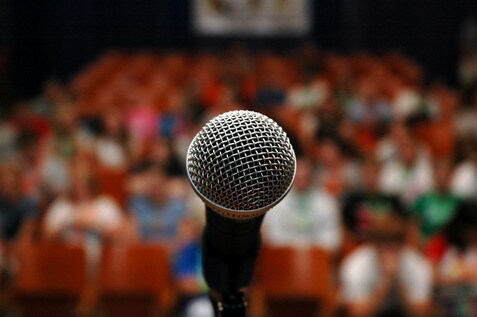 The school year is winding down and, since I am teaching Speech and Debate this year (first time it has been taught at my school), I decided my students needed to feel what it was like to deliver a speech in front of a large audience. Up until then, they had only given speeches in front of our class of about 25. On Wednesday, they gave their speeches in front of 400 students and faculty. Honestly? I was more nervous than they were. When they asked me why I was freaking out (I even wrote “FREAK OUT” as the agenda on the board for the whole week), I told them it was because they were my babies (16-17 year old babies, but babies nonetheless). I want them to be successful and confident and I was worried I hadn’t prepared them enough. They did such an amazing job. Today, I walked into work and every single teacher who saw me complimented how well my students did. They were really impressed with their speeches and debates… I feel like a proud mama. When do you feel happiest at your job? Since I too am a teacher I completely agree that there are wonderful days, and then there are trying days. This year was the most challenging (out of two, but whatever) because I had to switch grade levels in October. Although I was sad to leave my students, I had a feeling there was a reason for all the madness. When April rolled around a colleague of mine came to me and said "those students in your class need you and that is why you needed to move back to 4th grade". I didn't understand what she meant until a month later when finally all the pieces came together and I got 3 students qualified for special education that everyone said I was wasting my time on and that they were just second language students and that was why they were behind. It turned out that all three had significant learning disabilities and their previous teachers just let them move through the system. Yesterday, my last day with students, the students all wrote me letters and all of them were individual and sweet; they all wrote about a special experience they had with me and it was heartwarming. The best part is that I didn't even assign it, I told them to play board games but they all decided to write letters. Amazing!